The establishment of the Mission in 1972 by a small group of forward looking persons began a new chapter in the history of Shri Krishna Pranami faith. The Kuljam Sarup (Tartam Vani), the sacred grantha containing 18758 poetic verses of Mahamati Prannath, was so far confined to hand written volumes and was not easily accessible to other than Pranamis. The Mission brought it out in printed form for circulation to all interested people. Since then, with teh cooperation of the Dharam Gurus and several learned academicians a large number of publications pertaining to the messages of Mahamati and related religious scriptures have come forth. The main emphasis has been on the similarities between all religions and necessity of creating atmosphere for one universal religion to bring love and harmony among all human beings. The dictionary meaning of the word Sanandh is authentication and it also stands for relationship. The contents of this book are directly related to both of them. The country was then being ruled by Mughals who were blind followers of ritualistic religion There was a need to make them understand the true and in-depth message of the koranic teachings. In the name of religion the ruling community was ill treating the followers of other religions. A special tax called Jazia was imposed on the Hindus. 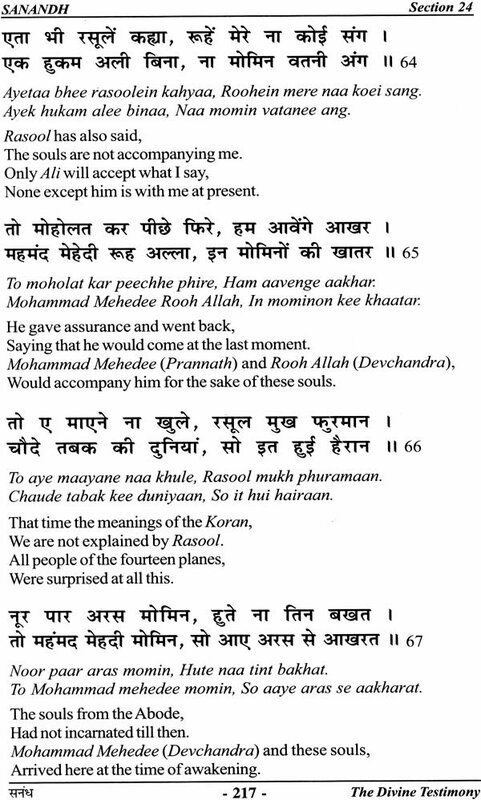 Mahamati desired to have a meeting with Emperor Aurangzeb to make him realise about his unpopular actions and the realities of the truth underlying the Islam and also about the path to attainment of divinity. In this connection he sent his twelve selected followers to perform the task of approaching the Emperor but the efforts did not prove very fruitful. 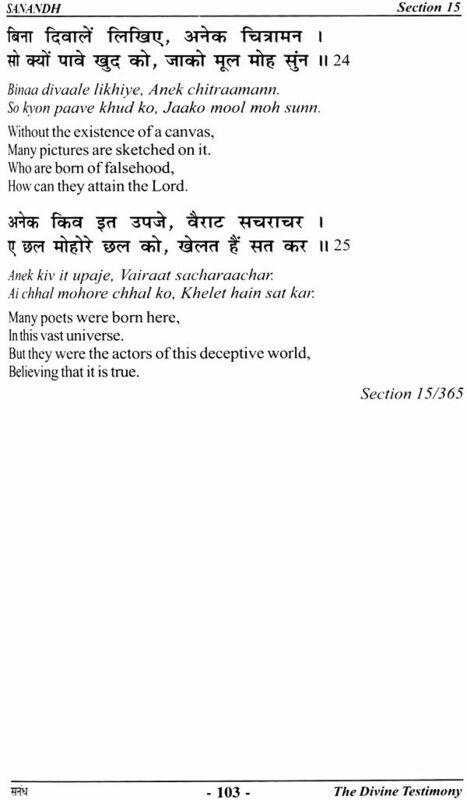 However he has enunciated and clearly explained the preaching of Koran in Sanandh and other books. During his long religious journey through different places the book Sanandh descended upon Mahamati Prannath during the year 1735-36 VS (1678-79 AD) at Anup Shahar. Mahamati has covered a number of topics related to Islam and the holy book of Koran in Sanandh He has explicitly described the meeting of Hazrat Mohammad with the supreme Lord, known as Shab-e-Myaraj. 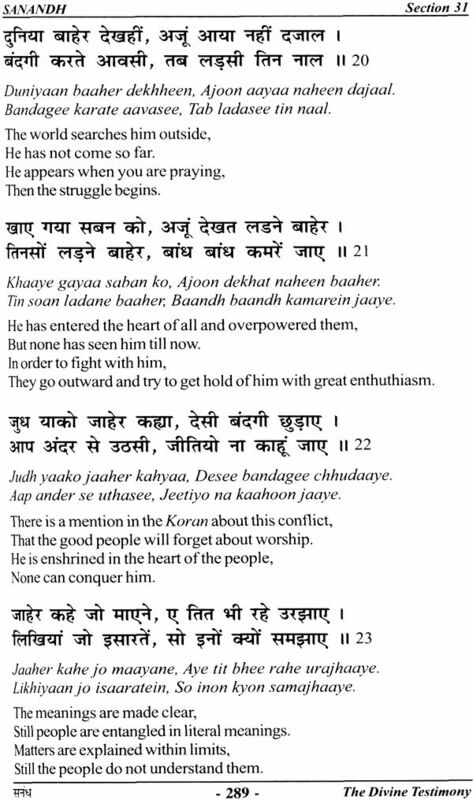 Being a staunch supporter of Hindi language he has mostly written his verses in this language. He was of the view that Hindi is the simple and most appropriate language to reach the masses of India. He also had great respect for other languages. Two sections of the book are in Arabic and one in Sindhi. 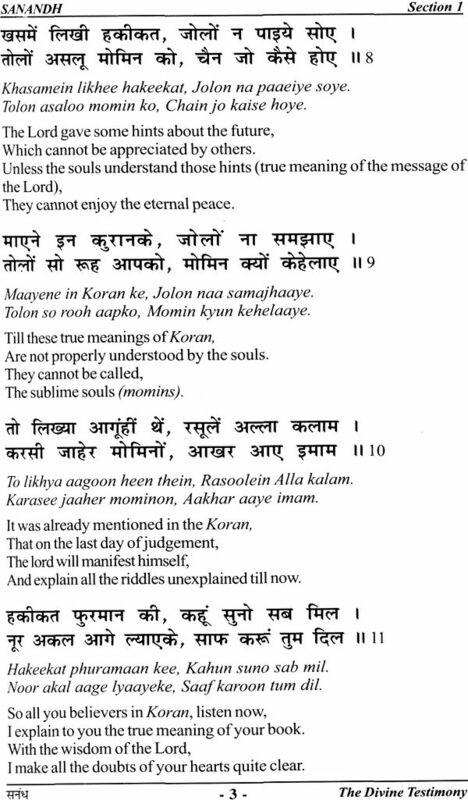 Among the various subjects dealt by Mahamati here are- Kalma (the Muslim prayer), the Koran and other Islamic literature, the ritualistic religion and the basic principles of Islam. 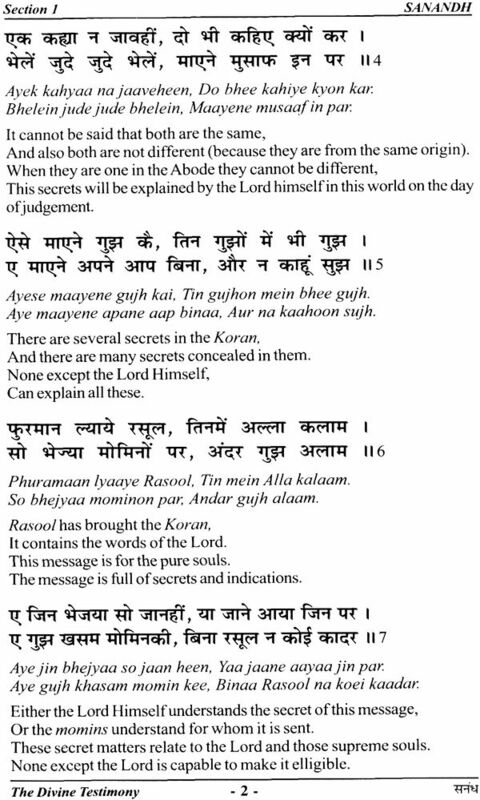 In the section Nabi aur Narayana he has brought out the approach and reach of the different godly incarnations. 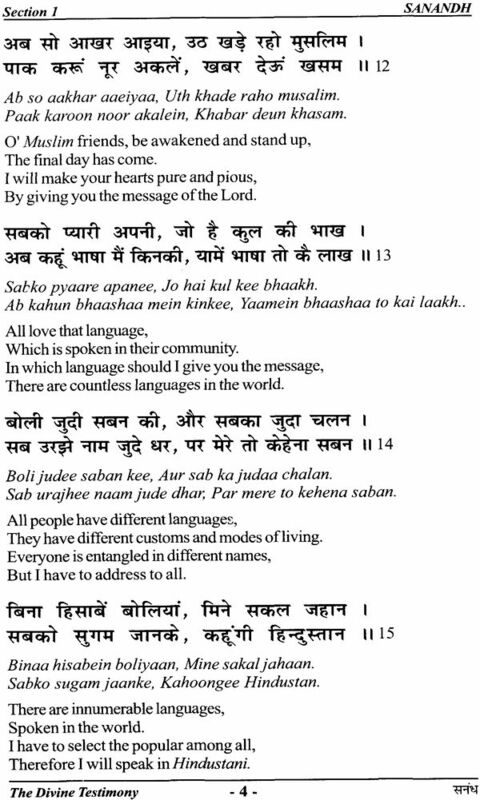 The details given in the short and the descriptive letters (chhoti and badi patri) provide adequate directions to his followers to appreciate the similarities between the teachings of all religions. The book is a true guide for those who have not yet realised the realities of the religious teachings. He also condemns those religious leaders who are misleading the innocent people on the pretext of religion. 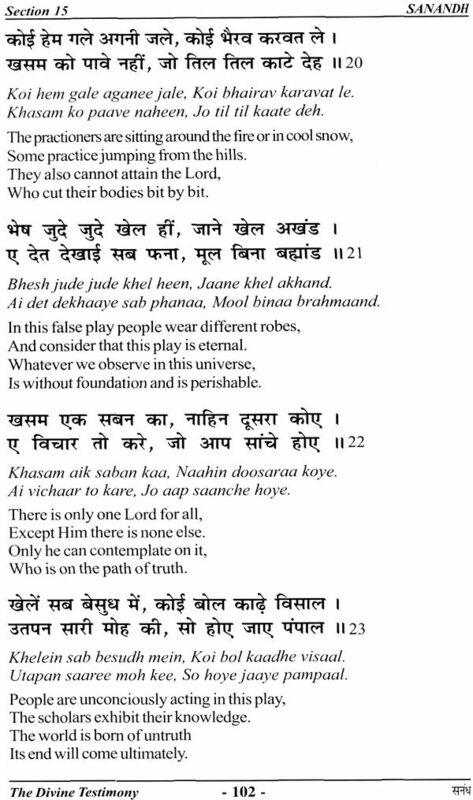 The book Sanandh comprises of 42 sections and 1611 verses. 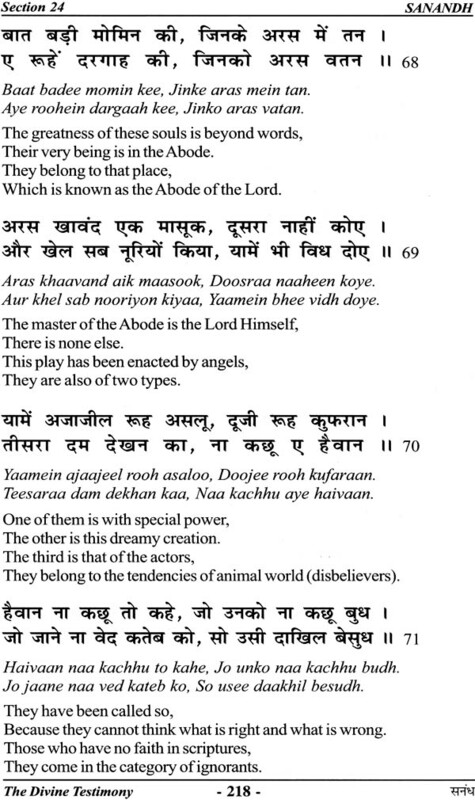 However the section number 4 to 18 are also appearing in the book Kalash, almost 361 verses are taken from Kalash Hindi. 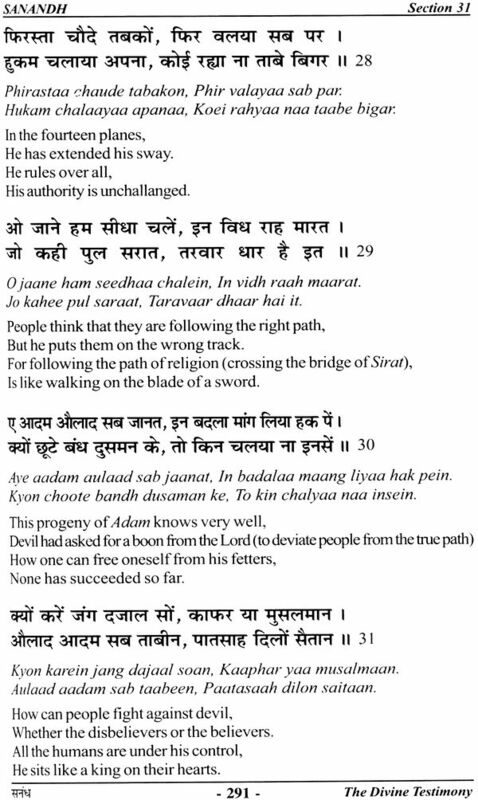 The efforts put up by Dr. R. K. Arora of translating the Tartam Vani deserve utmost appreciation. May the Lord bless him with many more years of life and strength to continue this sacred work. The cooperation of Smt Vimla Mehta, Shri K. K. Mehta and Dr. Pran Gilotra is gratefully acknowledged. Sanandh stands for evidence or testimony. It is a document to explain the true religion. 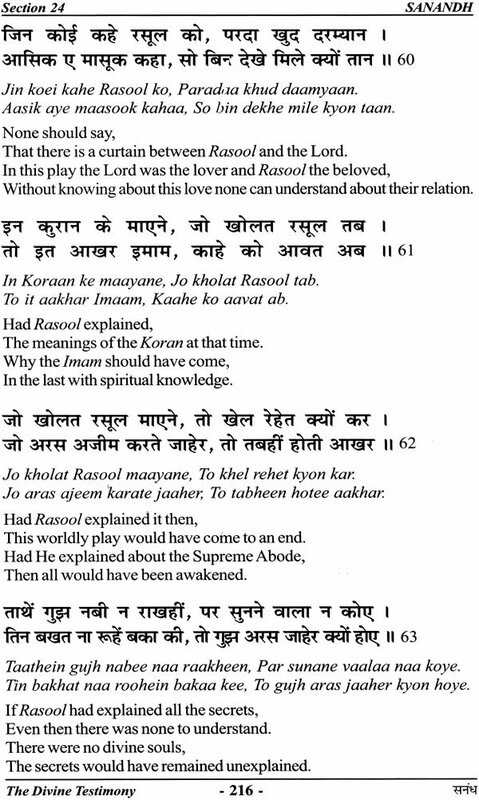 During the days of religious strife between the Hindus and Muslims, Mahamati wanted to convey the true message of both religions to Emperor Aurangzeb. 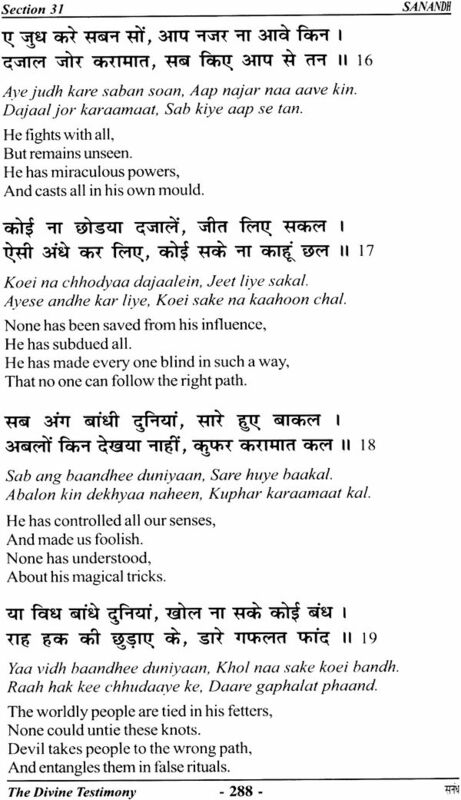 Mahamati says-"Everyone considers his faith to be superior and his prophet to be the only true teacher. But remember, there is only one God who belongs to everyone. All religious texts have been written at His command; all prophets have His power and also His message with them. If you want to convert anyone, do not do so by changing his name, dress or place of worship. Convert his mind so that he becomes a better person. By physically changing the appearance nothing is achieved." Everyone believes that the whole truth is contained in their scripture and also contains the entire knowledge, without considering the other scriptures. 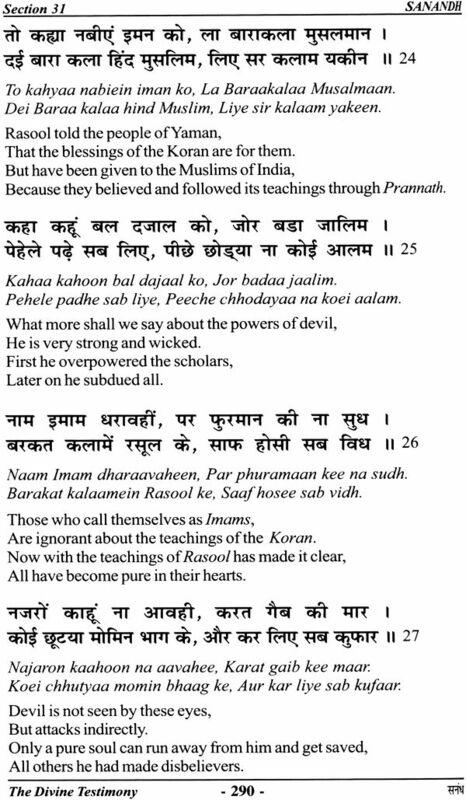 But Imam Mehedee, who appeared in the form of Mahamati Prannath, preached that all basically belong to one religion. Only such an umbrella of a single religion can herald religious toleration and understanding among all. In Sanandh Mahamati Prannath has conceptualized a comparative religion. He lived in the Arab land for considerable period and came in contact with Islam and its philosophy, that is why the Islamic vocabulary is profusely used in this book. 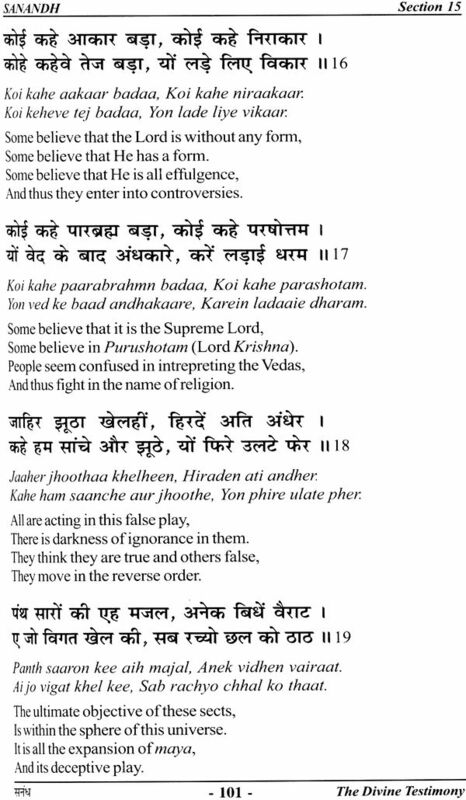 The Sanandh in particular and Kulzam Sarup in general quote many references to give a substantive comparative enunciation of the religions. According to him the concept of one religion is the only methodology where essence of all religions is grasped and agreement reached in the domain of the religion. It removes all the confusions and misunderstandings and leads to essential unity of all religions, essentially Hindu- Muslim unity. 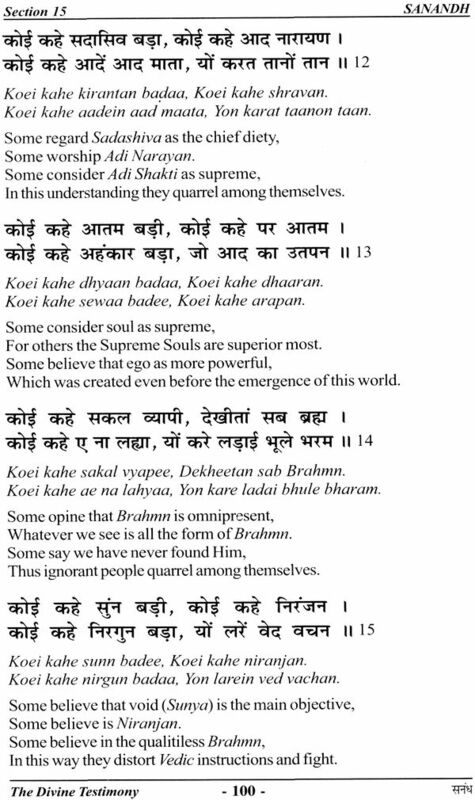 In the entire devotional current of that era Mahamati Prannath is the only saint who has talked about these religions, their philosophy and traditions in details, and also their so called differences-causing stresses and misunderstandings upon One God. This spirit, in general, also pervades in other saints although there may be difference in language and social conditions. This book Sanandh establishes Mahamati Prannath as a great unifier and pacifier who was sent by the Lord to mitigate conflicts among communities leading to a life of peace, love and brotherhood.